This massive RPG clocks in at 245 pages, 1 page front cover, 1 page editorial, 2 pages of ToC, 6 pages of KS-backers, 1 page back cover, leaving us with 234 pages of content, so let’s take a look! I received this book as a gift from one of my patreons for the purpose of a review. This pdf has been prioritized and moved up in my review-queue accordingly as a prioritized review. The first thing you’ll notice when opening this book is that it’s extremely newbie-friendly: The concept of RPGs is explained in concise, easy to grasp terms – including an explanation of dice, terms and the like: I embarked on a brief experiment: I handed my printed out copy to my granny and told her to read it. Guess what? She got it. She finally understood what this roleplaying-mumbo-jumbo was all about. Ryuutama is extremely user-friendly and guides the players and GM, step by step, through the process of character generation, with classes being grouped by focus: Attack Type, Technical Type and Magical Type. You have 4 basic stats: Strength, Dexterity, Intelligence and Spirit – at character creation, each of these values can be either 4, 6 or 8: You choose from 6,6,6,6, or 4,6,6,8 or 4,4,8,8. The stat itself also represents the die you roll when testing. All other relevant stats are derived from these simple base attributes: Hp is Str x 2, MP (the resource used to cast spells) is Spirit x2, Carrying Capacity is Str+3 (if you exceed this level, you take the excess as penalty to your checks). Each character is supposed to have mastered a weapon, the use of which and damage is governed by attributes as well: Light Blades, for example have an accuracy of Dex+Int+1 and a damage of Int-1, while Axes use Str+Str-1 for accuracy and Str for damage. Each character also has a personal item, to which s/he has an emotional bond as well as 1000 GP starting budget to get ready for the journey…for in Ryuutama, the focus does not lie on slaying monsters or defeating demonic incursions. Instead, the basic focus of this roleplaying game is one refreshingly different, one on properly traveling the world, hearkening back to the picturesque ideals and romanticized notions of the apprentice’s journey, blended with a sense of wide-eyed wonder and creativity you’d expect in Hayao Miyazaki’s works – and this focus also shows in the easy class kits available: From merchants to farmers and nobles, we have roles that go beyond the traditional 4-6 roles often featured in fantasy roleplaying. The respective classes sport unique skills that are derived from the base attributes in much the same way as the weapon damage I described above: I.e., you have dead simple basic math. As for magic- there is incantation magic, which unlocks in 3 steps and season magic similarly unlocks with the progression through the character levels. The pdf also champions different roles for players and characters to fill – from quartermaster to leader and mapper, the roles make sense and prevent issues in game. Leveling up is similarly a very simple, streamlined process: There are 10 levels, with every even level providing a stat-increase (i.e. d4 -> d6, d10 -> d12…). At 3rd and 7th level, characters get a terrain/weather specialty, choosing one of the 22 types and gaining +2 to rolls regarding this type. 4th level provides immunity versus one status effect and 5th level provides an extra class’s benefits. 6th level provides a second type. At 9th level, you may 1/day take 10 in a given specialized season and 10th level provides basically a GM-centric ability to embark on a truly legendary journey. Different qualities for objects are covered with easy modifiers – you can e.g. get uncool-looking items at a discounted price or unbreakable orichalcum items, all with mechanical repercussions. Similarly, effects of good (or bad!) food and public facilities like bath-houses, specialty goods and the like are covered in impressive detail. Animals also deserve special mention – you can bring one free animal with you (and don’t have to micromanage said creature’s upkeep), but only the merchant and farmer class may have more animals – and, interestingly, there are special qualities for animals: Loyal or particularly tough animals, for example, cost more but also grant you interesting benefits, while animals with an attitude problem may be cheaper…but refuse your command in inopportune moments. From food to perfume to containers, there are a lot of nice items to bring along…including e.g. a grandfather clock! This item-driven approach also extends to healing herbs, of which a vast array is provided, by terrain and level: From moonlight Snowgrass to Barrierwood Stalk, the prevalence and usefulness of these can generate a healthy respect for mother nature. Spellcasting is dead simple: Choose a spell you know, choose a target in the spell’s range, speak the magic words, expend the MP and roll INT+SP – if you roll a double 1, the spell fails, otherwise it works just fine. Spell effects from the same spell do not stack, but those of different spells do. Casters may end a magical effect at any time. Incantation magic is based on study, seasonal magic is based on emotion…and that’s about it. One paragraph and we have the foundation of a simple, efficient magic system. It should come as no surprise, then, that the presentation of the spells is similarly simple. Now I’ve mentioned skill checks before, but how do they work? Basically, each skill is based on two attributes, like Str+Int or Dex+Sp. You roll the two dice. If you have a double 1, you have a critical fumble, if you roll maximum die-size, you instead get a critical success. If you’re thinking that this makes criticals less likely in higher attributes, you’d thankfully be wrong: If you have e.g. a stat of 10 in a related attribute, any roll of 6+6, 6+8 or 6+10 would result in a critical success, making them pretty common occurrences. Skill-checks have a difficulty (like a DC) – if you manage to reach this number, you succeed. Contested checks are similarly simple: Both parties roll, the winner takes it all. Ties are simply rerolled. From hard exercise to drinking or delicate work, sample skills are provided and their difficulty, obviously, is modified by situational modifiers and retries are penalized slightly. Concentration is interesting – you can pay a fumble point (gained from a fumble) or half your MP for a +1 bonus; both for a +2 bonus before attempting an action…but if your MP are 0, you faint…so in case you only have one MP, better make that shot count! This system is very simple, but one that provides a surprising element of tension in play – kudos! Condition is also important, as are conditions like sickness and injury. With a focus on journeys over combat, travel speeds and terrain and weather types (and lavishly rendered, gorgeous dragons for each terrain type!) can be found here alongside common topological sights for the respective environments. Battle is simple: I already covered weapon-rules; initiative is governed by Dex+Int and the battlefield has abstract areas and 5 objects strewn about the battlefield, making the tactical options available more diverse. Item use, defending, feinting – everything combat-related is just as concise and simple as the rules introduced so far. Characters die when their HP reaches negative Condition – so keeping up with food etc. is important indeed! And yes, the system per se champions a low lethality without making it too easy on the PCs and yes, nonlethal damage is covered in accordance with the child-friendly tone of Ryuutama. The book also sports town-creation rules and even world-generation rules that guide the GM through the process in a rather simple and efficient manner. Speaking of the GM: It is important to note that the GM is more than just a spectator here: The GM has a dragon in human form, a Ryuujin, a kind of GM-PC that belongs to one of 4 different races, effectively the classes of the GM-PC. These characters sport an artefact and may provide Bénédictions for the players, which not only provide significant bonuses, they also act as roleplaying catalysts. Ryuujin are not constant additions to the traveling group, but they may show up when the PCs are in a pinch…or help them in other, unobtrusive (or obtrusive) ways – they are, however, not Elminster: Ryuujin may actually die, so PCs too complacent regarding their help may have to save their guardian dragon! When a Ryuujin goes full-blown dragon-form, that action is referred to as a réveil…but it does cost the Ryuujin’s life points, providing an in-game rationale why they can’t save the PCs all the time. The focus on new and inexperienced roleplayers means that this book also goes, step by step, through the process of scenario-creation, simple though that process may be for Ryuutama. It should be noted that sheet-wise, I’ve scarcely seen a more detailed array of sheets: For scenario-structure, fight scenarios, towns and events, there’s a specialty-sheet for just about everything, rendering this even more user-friendly than you’d expect. And yes, we get a simple, nice sample scenario for levels 1 – 2 to kick off the journey. Now obviously, such an RP also requires adversaries, monsters, if you will: The massive book provides a huge array of them and going through them in detail would bloat this review beyond belief – however, there is a little gripe I can field here: Do not expect artworks for the monsters. While properly described, I still would have loved to see the absolutely lavish artwork to extend to the monster-section…but then again, I’m spoiled by the big, more main stream roleplaying games with infinitely higher budgets. A significant and concise Q&A-section closes the book – alongside the 18 (!!!) sheets, including e.g ration tracking, combat etc. – stunning! Editing and formatting are pure excellence – I noticed not a single hiccup in the whole, massive book! Layout adheres to an easy to read 1-column full-color standard that is sufficiently printer-friendly. Artworks are copious and range from explanatory, chibi-style manga-comic panels that explain actions to stunning b/w-artworks for the Ryuujin. The pdf comes fully bookmarked for your convenience and with the sheets in additional zips. Atsuhiro Okada’s Ryuutama has been translated to English with a level of love that oozes from every page by Matt Sanchez and Andy Kitkowski – going above and beyond the duties of translators, they managed to maintain the intent of the original as far as my pretty lousy Japanese goes. (A Japanese reader kindly sent me an excerpt, showing me clearly the limits of my own rudimentary proficiency in the language… btw. also the reason this review was slightly delayed…) I am thoroughly impressed by the ability to properly capture not only the wording, but the intent of the original. But you’re not interested in these particulars, right? What you want to know is whether this is a good game. 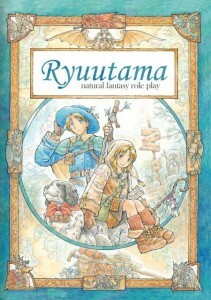 The answer to this question, without a doubt, has to be a triumphant, resounding “YES!” Ryuutama is not only breath of fresh air with its wholesome take on fantasy; its level of detail is staggering, its user-friendliness remarkable, particularly considering its status as a translated game. This game is exceedingly simple to understand and works perfectly for any children ages 4+ and up, but it also is a superb game for adults that can still feel the sense of wonder and wild-eyed excitement evoked in the best of Miyazaki’s movies. What I love most, though, would be the unobtrusive GM-PC-angle alongside the fact that this game does not cuddle the children: Yes, this is a roleplaying game suitable for just about all ages, one that can easily teach basic math, responsibility, planning…but also one that can teach respect for mother nature…and one that does not shirk away from topics such as PC death. In this way, Ryuutama is not only fair, it is a game that, and this is my firm conviction, will really benefit the development of kids, supporting several virtues we all try to convey as well as the usual basic math competence we want to instill. The staggering level of detail further enforces this…so when do we get the first full-blown journeys/scenarios for this glorious book? Oh yeah, right – the final verdict: Ryuutama is worth every cent of its fair asking price, is perfect for children and adults and an all-around well-crafted roleplaying game with easy rules and a unique theme – it is an easy 5 stars + seal of approval and receives a nomination for my Top Ten of 2015. If you’re looking for a great way to introduce children to roleplaying or are fed up with slaying monsters and the cynicism of our world, embark on a journey with Ryuutama – I guarantee you won’t regret it! You can get this brilliant, inspired roleplaying system for players of all ages here on OBS! Here’s the homepage of the devs! Additional resources (like playing Koneko Goblins) for Ryuutama can be found here! This is also a good example of the strengths of crowdsourcing. The creators took the advice of their Patrons and let them look over the document for any problems. Then three others scanned it for micrometer fractions and scratches. And those, too, were fixed. Then we fixed it some more. And submitted it for finalization.